About 30,000 years ago, human cultures along the western coastline of the Pacific Ocean started to migrate eastward across the great expanse of the Pacific Ocean. The people who lived around the Mediterranean Sea began exploring this nearly landlocked sea several thousand years ago. About 650 years ago, European explorers turned to the sea to find faster trade routes to cities in Asia and Europe. Besides being a famous statesman and diplomat, Benjamin Franklin was a well-known American scientist. He contributed to oceanography in the mid- to late 1700s by making and compiling good observations of ocean currents off the US East Coast. In 1831, and in the teeth of a gale, the HMS Beagle, a British warship, left Devonport, England, for an expedition to map the South American coastline and to carry out chronometer surveys all over the globe. Modern oceanography began with the Challenger Expedition between 1872 and 1876. It was the first expedition organized specifically to gather data on a wide range of ocean features, including ocean temperatures seawater chemistry, currents, marine life, and the geology of the seafloor. In the mid- to late-1800s, Matthew Fontaine Maury became head of the US Navy’s Department of Charts and Instruments—only to discover that the Navy had very few charts of the oceans! The oceans have always played a big role in wars. Ships transported armies and supplies, blockaded harbors, besieged cities, and attacked enemy ships doing the same things. But the Civil War helped launch a stealthy new seagoing weapon that became common in 20th century warfare—submarines. Until only recently, geologists had thought that Earth’s surface hadn’t changed much since the planet formed 4.6 billion years ago. They believed that the oceans and continents were always where they are now. Oceanographers had been able to collect sediment and rock samples from the ocean bottom ever since the Challenger Expedition. But they did not have the technology to enable them to probe very far beneath the seafloor. Most of the major discoveries in oceanography have occurred only within the last 50 years. We have found that while rocks and sediments on land are usually wiped away by weather and erosion, rocks and sediments on the seafloor are a well-preserved archive of information that allows us to unravel Earth’s geological processes and history. In the mid- to late-1800s, Matthew Fontaine Maury became head of the US Navy’s Department of Charts and Instruments—only to discover that the Navy had very few charts of the oceans! But it did have a big storeroom of dusty logbooks from Navy ships. In these logbooks, sea captains traveling the North Atlantic had recorded their daily locations, as well the speeds and directions of winds and currents. Maury realized the books contained a gold mine of information. By compiling records from many ships, he saw patterns. He made charts of ocean currents and winds that helped captains plot the best sea lanes for their voyages. He added more details to these charts by asking merchant captains to make more observations and send them to him. He also asked sailors to put messages in bottles. The message noted the ship’s location when the bottle was thrown overboard. When the bottles washed ashore, the finders were asked to send Maury a note telling him where they found the bottle. In this way, Maury could figure out more detailed ocean current patterns and add them to his charts. In the late 1800s and early 1900s, Prince Albert of Monaco used a similar method to figure out what happened to the Gulf Stream as it approached Europe. By compiling the notes he received from people who found washed ashore bottles, he determined that the Gulf Stream splits in the northeastern Atlantic. One branch heads toward Ireland and Great Britain, while another part of the Gulf Stream heads south past Spain and Africa, and then back west. Prince Albert’s knowledge of currents proved valuable during World War I. He was able to tell military officials how explosive mines would drift in the ocean and where they would land. Authorities found mines just where Prince Albert had predicted and disarmed them before they exploded. 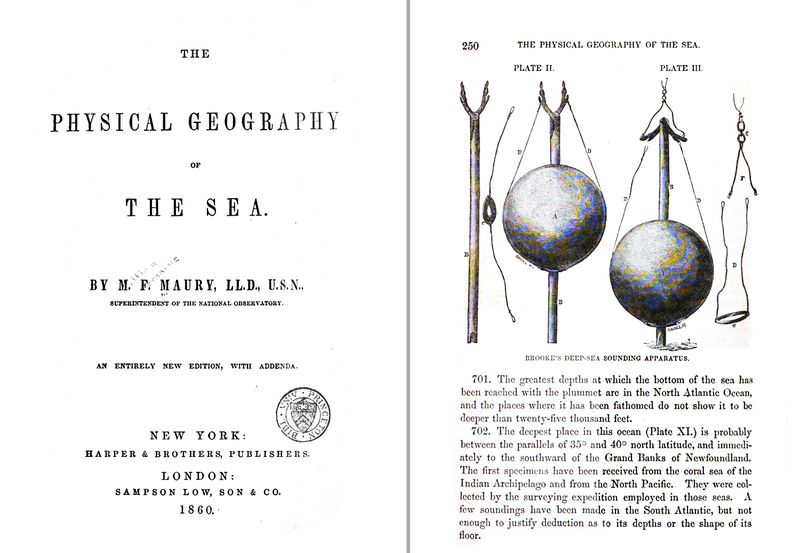 In 1855, Matthew Maury published “The Physical Geography of the Sea,” which is now credited as “the first textbook of modern oceanography.” The devices on the right hand side of the page are sounding instruments to measure the depth of the ocean. 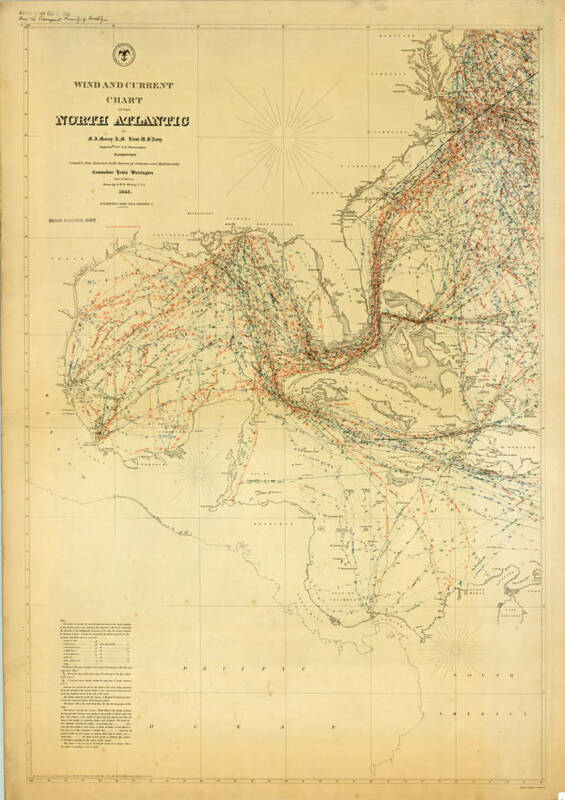 In 1847 Maury published a series of charts called Wind and Current Charts. Above is a part of one of the charts.